This is probably the question that I am asked most in my life.. Save for maybe “you want MORE kids? ?” Luckily, this is one of my favorite questions to answer! People don’t seem to understand why in the world we would ever even consider homeschooling. I mean, homeschooling is what weird people do to keep their kids from ever experiencing real life, right? Wrong. That said, homeschooling was really the last thing I ever thought that I would do with my life. I never evenconsidered being a stay at home mom! I had it all planned out. I would work while finishing my degree, get a good job, and work work work. Maybe I’d even own my own business one day! But homeschooling? There was certainly no room for that. Well, you know what they say.. You want to make God laugh? Show him your plans! I found myself staying home with my two boys and pregnant with my third. I fully expected to go stir crazy and rush back to work at my first chance. I am most definitely NOT a domestic diva.. I don’t even cook dinner most nights! I am certainly not “that” mom that does Pinterest activities and makes sandwiches into fun shapes.. I was the mom that felt like my greatest success was if all the kiddos ate something for dinner before I got them to bed, and if they were in jammies and not just a diaper, I was super mom! I never believed that I would actually enjoy being home all day with my kids! That’s not to say I didn’t love being with my kids, but all day long? It turns out that it is the most fulfilling “job” I’ve ever had. I get to kiss their boo-boos. I get to make their snacks. I get to read their bedtime stories. I get to hear their thoughts on everything. Well, my oldest, Mr. C. started showing clear signs that he was ready to learn. Sidenote, I know that most homeschool mamas are adamantly against formal schooling or “school at home” at such a young age, but I’m telling you ladies, this kid thrives on workbooks. This is a child who loves flashcards. It wasn’t long until we realized that the preschool activities that I found for him were just not cutting it. I looked around to try and find some curriculum for him, and after a few placement tests, we found that he was ready for kindergarten in most subjects. That was in June. He finished his kindergarten curriculum in September and we’re onto first grade now. Now, he is only four. He isn’t supposed to go into “kindergarten” until next September.. If we were going to put him into school then, he would be on a second grade [or higher] level and incredibly in the school system. That isn’t the kind of education I want for my son. One where he’s “smarter” than he should be, but he really isn’t learning. I want to nurture this love of learning that my son has. I want him to be able to explore his own interests and be his own person in this world. Even if that means this brown thumb mama is studying botany for a whole year. So for now, we will be homeschooling Mr. C. He doesn’t show any signs of slowing down, and we’re keeping things at his pace. I covered why we’re homeschooling our son with special needs as well, so feel free to check it out! 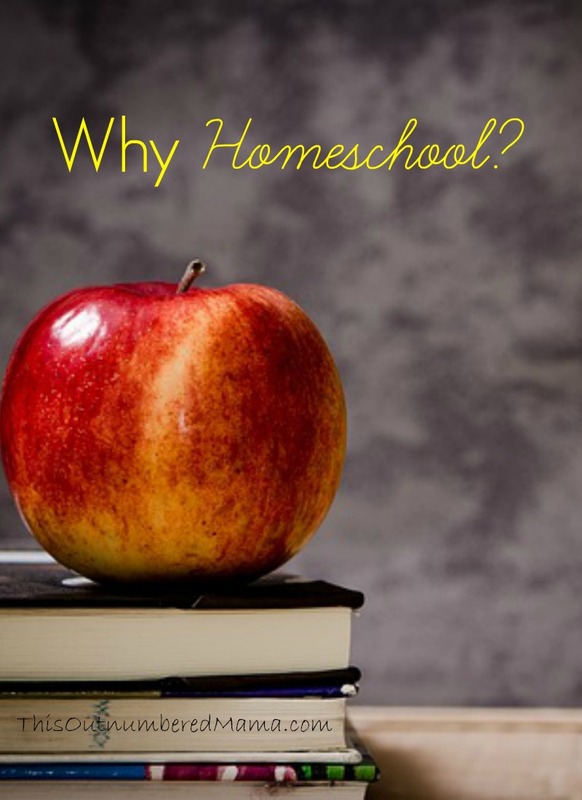 Your turn, why do you homeschool?